So this may seem like a strange thing to devote an entire blog post to, right? Because all flip-flops are kinda the same, right? Well, yes, that’s what I thought until a pair of Beach Athletics flip-flops dropped through my letter box. I’ve loved and lost flip-flops in the past, from those cheap and cheerful ones that come free with magazines at the airport, to bejewelled Havaianas which have tragically snapped when I’ve dared to wear them beyond the beach. So I decided to put the Beach Athletics flip flops to the test on the mountainous terrain of Kalkan, Turkey. First, what makes Beach Athletics flip-flops different from the rest? Well firstly the thick rubber sole has been designed to fit snugly to your feet (you can see the bumps and lines in the top image) which makes them noticeably more comfortable. They have more grip than your standard beach sandal, making them the ideal shoe choice for, let’s say, a holiday day trip! Our villa in Turkey was up a VERY steep hill. Just a trip to the local supermarket would put professional rock climbers into a hot sweat (and not just because of the 40deg heat!) but the Beach Athletics flip flops survived the test, with their super grippy soles enabling me to power through the climb! 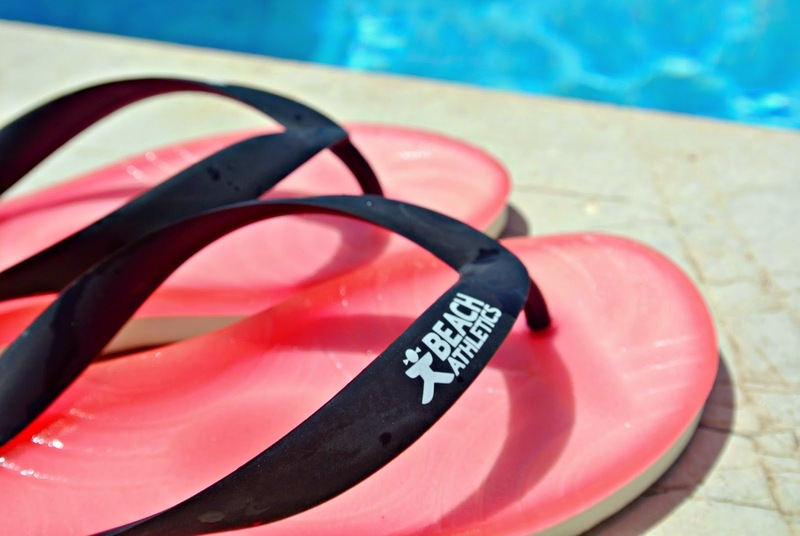 Of course flip-flops are most at home on the beach, and while some sandals will become salty and yellow at the hint of seawater, the Beach Athletics flip-flops still looked as good as new on the last day of holiday (image above taken on the last day! ), despite being worn while jumping waves on pebble beaches, playing volleyball in the sand, and trekking through the Saklikent Gorge. So wow, I did it, a whole blog post just to rave about a pair of flip flops! The full range of Beach Athletics flip flops can be seen on their website here, and you can also now buy them from Office shoes here.